GRANTS PASS, Ore. -- Oregon officials were successful in getting permission to kill sea lions that feed on protected salmon trying to swim upriver to spawn. Now they want federal approval to shoot a type of seabird that eats millions of baby salmon trying to reach the ocean. In an April 5 letter to the U.S. 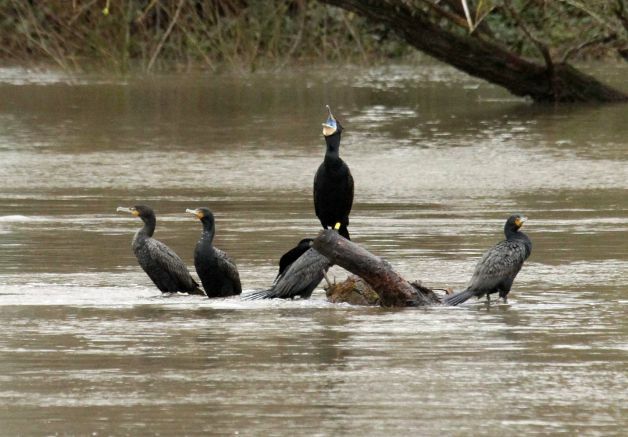 Fish and Wildlife Service, Oregon Wildlife Chief Ron Anglin said harassment has "proved insufficient" in controlling double-crested cormorants. He said officials want the option of killing some of the birds to protect endangered wild fish as well as hatchery fish vital to sports and commercial fishing. Oregon needs federal approval to start shooting dozens of the long-necked, dark gray seabirds on coastal rivers because they are protected under the Migratory Bird Treaty Act. The letter obtained by The Associated Press was a formal request to add Oregon to the 28 states authorized to kill cormorants to protect public resources, such as game fish. The Fish and Wildlife Service is updating the authorization, which expires in 2014.